"Newcastle's Special Blend: Irish and Scotch. A splendid response is being made on Tyneside to Lord Kitchener's appeal for more men, and records in recruiting figures are being put up. 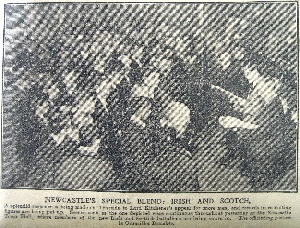 Scenes such as the one depicted were continuous throughout yesterday at the Newcastle Town Hall, where members of the new Irish and Scottish battalions are being sworn in. The officiating justice is Councillor Bramble."